Skerries efforts failed to light up a damp dark afternoon in Gibson Park as their scoreless second half performance saw them leave empty handed. Malone had opened the scoring with a penalty just as highly regarded referee Brian MacNeice had to depart the field with an injury. On twenty minutes a crucial lack of concentration caught the defence napping at the base of the scrum allowing Malone scrum half Shane Kelly steal possession and link with No.8 Ross Todd for the first try. Skerries quickly replied when they turned down a penalty attempt opportunity to choose the lineout option and the resultant disciplined maul allowed Chris Tonge touchdown. Out half Ciaran Frawley tapped over the conversion from the touchline. As half time approached a kick ahead by Malone saw the ball at rest on the Skerries tryline and touched down by fullback Maurice McAuley for what should have been a 22 metre dropout. 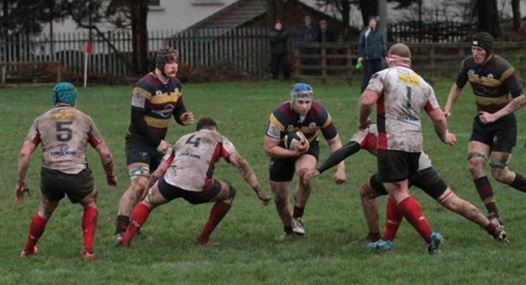 From a distance, the substitute referee saw it differently, and awarded Malone a 5 metre scrum. This was changed to a penalty following a critical comment from a Skerries player and the successful kick put Malone ahead 11-7. The second half started badly for Skerries then it got worse. Injured prop, John Condron, could not resume and was replaced by Neill Martin. The consequence of a yellow card to Evan Sherlock was a further three points to Malone but numerical equality was restored when a show of petulance from Malone’s Richard Millar resulted in his temporary departure. A maul following a lineout to Malone yielded a second try for their most effective player, Ross Todd, and converted by fullback Campbell. Having only recently entered the game prop Neill Martin’s evening was cut short with injury and the match resumed with uncontested scrums. Malone then dismissed any hopes of a Skerries repeat of last week’s second half revival when a back line movement introduced substitute forward Ben McDonald into the midfield who broke through a threadbare defence and his score put them into a comprehensive lead of 26-7. Ross Halligan, Eoin Matthews, Paul O’Loghlen and David Quirke were now introduced to the Skerries side who desperately sought a consolation score but were controversially denied when the referee over-ruled fullback Maurice McAuley’s touchdown. On a positive note for Skerries the forwards, Joe Glennon and Thomas O’Hare, are becoming increasingly influential in their performance while the enthusiasm and work rate of Kieran Leonard sets a marker for his colleagues. Eoghan Carron at scrumhalf tries very hard while the emergence of the excellent young out half Ciaran Frawley will be hugely interesting. Skerries are in control of their own destiny. January is that time of year when things become really interesting and the next number of weeks will bring clarity to the situation. While not contenders for promotion there is plenty to play for. There is nothing that cannot be fixed. The defence is surrendering too much and needs to suffocate the opposition. There is little wrong with the Skerries attack.